From the top of a marquee a pool of light just 12” across shines onto a table top. In a darkened marquee this is a very effective way of highlighting features, floral arrangements or centre pieces on round tables. Great for lighting bars or serving areas. Available from Spaceintense in Blue or cool or soft White; pea lights can be used around the eaves, as swags into the top of the marquee or to decorate trees inside or out. They are very versatile and add gaiety to any occasion. LED lighting can be controlled to provide almost any colour lighting. You specify the shade and we programme the lights and leave you with a control box so that at the press of a button you can change the scene completely. Stage and dance floor lighting can also be supplied. With the flick of a switch the mirror ball turns, a profile spot light’s shaft of light is broken into hundreds of tiny beams projected around the marquee. 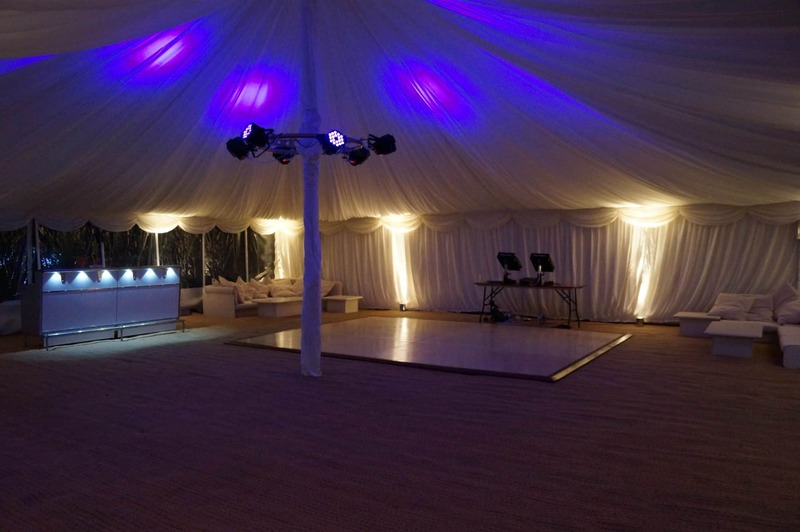 Spaceintense supply a 20inch mirror ball and for larger Marquees a 30inch mirror ball.